How is it that we make Great Friends? Isn’t it weird that as we travel through life, we run into people who just seem to make an impact, even from a short interaction. Despite long distance and time between interactions, when you meet, it is as if you have been together all along. I am most fortunate to have a few of those. The MtA Gang is one group. It seems like the crew from Preston Middle School may also be entering that circle. But this blog entry is about Jonathan and Valentina and Angelo. 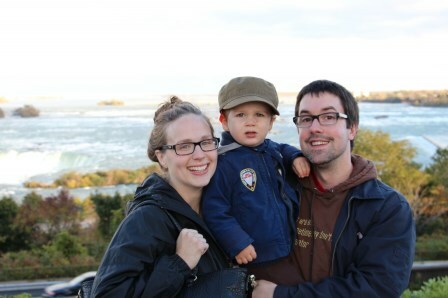 It just so happens that Jonathan and Valentina and their son Angelo were also attending the ECOO conference. Despite all the work that they had to do professionally, and the family responsibilities, they took time to have supper and even drive me to Hamilton, an hour each way. Thank you very much. I appreciate your friendship and think of you often. You have a beautiful family, inside and out. Maybe we will see you this summer. On the professional side of things, I was there to speak about my experience with Microsoft Partners in Learning in Cape Town. One of my prized possessions outside of family items is my BOOK of Awesome. One difficult Summer, my staff bought me the “Book of Awesome”. Although the book was AWESOME, it was what the staff wrote on the inside cover that was most powerful. 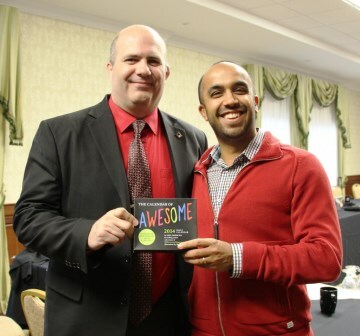 I was most excited when Neil, the author of “the Book of Awesome” was the keynote of SHAD CUP 2013. His keynote was good, but more impressive was the way he dealt with the very large line of book signings. He took the time to ask questions and tried to help. One girl talked about a tough time and Neil took the time to chat and make her feel better. Every person felt that he was concerned for them. His coloured markers were a hit. I had a chance to talk to him over supper. He gave me some good advice. He noticed that I did not really want to write a book, I just wanted to have a book. He suggested a TED talk and should it take off, then someone would write my book for me. AWESOME!! Robert Martilacci from Mind Share Learning picked me up at Pearson in the early evening. 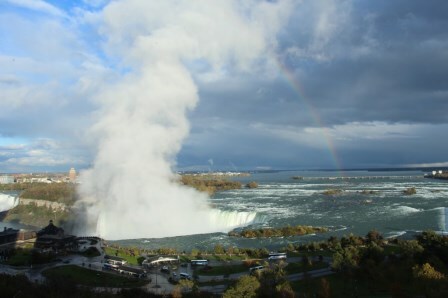 Not only did he take me to downtown Mississauga for a quick bite to eat, but he also did some research for me and found me a cheap bus ride to Niagara Falls. It gave us a chance to talk about Ed Tech, 21C, ISTE and conferences. HE asked if I would give a state of the union address on tech in the clas room, the succsses and the challenges for their summit. I need to ponder what I woul say for 5 min skype. It happens to conflict with the Preston Middle School Colorado visit. We arrive early at the bus stop. While we are there talking, a bus sneaks up behind us, makes a quick stop and is on its way. I just catch the driver’s attention and they pick me up. Turns out that they do no normally accept people with luggage. It is 35 $ cash. Earlier in the day I had reluctantly taken 40 $ cash from my wife. I get the last seat. The room that I have is a suite, three rooms, a tub for 3, fireplace, and two chairs pointing out the 12 ft round window with an awesome view of the American and horseshow falls. But I only checked in at 11:30 pm and have be up at 6 am, it is still dark, check out at 7:30 , just enough light to see the falls. I m early a ECOO for the audio check. I meet John from Microsoft Canada and we have a nice little chat. The presentations begin. John goes on stage. Someone’s phone goes off. So I turn mine off so it does not go awkwardly off while I am on stage. I talk about the Pil Flashpoint. John’s and my talk seem to fit nicely. All goes well. The audience even laughs at a couple of my jokes. AS I come off stage, one of the audience members come to chat. It turns out that her niece was in the background of the video. From there Lia and Camille and become engaged in some great talk. Lia and I go to lunch. All week I had discussed with my friend Jonathan about how my talk was at 2pm because that is what it was on my phone. So I’m thinking we have along time. Lia and I have a great talk about how PiL Canada can grow. The discussion is absolutely strategic, professional and in the best interest of PiL. She looks at her watch and is worried. It turns out, both our phones were still off. Our 1 pm co-talk started 15 minutes ago. When we walk in, Dustin is already part way through Lia’s portion. I begin the talk while the surface is booting up. Thank goodness for fast boot up on Surface. I will never forget to turn my phone back on again. I will also remember the time tricks that google plays on me with time zones. Other than loosing a few members of the audience, and looking terribly unprofessional at the start, the talk was OK. The audience seems to really buy in when I talked about the fine nuances of how to use word and excel to teach 21 Century Skills by making them work in groups without clear instructions and to do group writing of lab reports in real time in class time. Time after time, they seem to have an epiphany when I have this part of the talk. It is not in the tech that allows for great learning, but rather in the design of the learning activity. 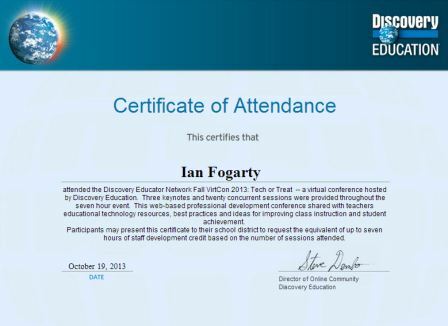 I organized the RHS “Discovery Channel Virtual Con Tech or Treat.” Thanks to Shawna, Tracy and Jason for showing up and for some great discussions. Perhaps this is the seed of something cool in store for RHS. Lia from Partners in Learning invited me to speak at ECOO in Niagara Falls. I am to give 2 talks. The first talk is about the XenoTransplant project, the PiL Global Forum and then how my participation has changed my teaching and my path. The second talk is about the learning suite. Getting ready for this talk allowed me to reminisce about my time with Team Canada in Cape Town. As cool as Cape Town was, I realized the importance some of the conversations that I had with my team members. Because of a talk with Trevor, I started to rethink English and why we take it in high schools. I wonder if the role of an English teacher should change to an language coach embedded in all the other classes and only a small portion of their time doing literature. Because of talks with Keli and Curtis, I started to rethink elementary education. Combine their work with the “Big World, Little Hands Project”, which was also introduced to me through PiL, and that is the foundation of my new high school philosophy. When high school looks like K-2, it will be a good day. A talk with Norm Lee convinced me to write. I asked what I should do, and he said WRITE. But I am a terrible writer. Since I started writing, things have been growing. If nothing else, writing helps organize one’s thoughts. Now I am working on a book. Encouragement from Jacynth and Lia have told me act on my dreams. Ken Robinson would say that Creativity is Imagination in Action. Thank you for helping me move imagination into creativity. Not only did the Pil and the GIEF give me a reason to create the Xenoproject which has lead to seriously considering high school renewal to look like SHAD high, but it gave me contacts and conversations that are chaning my perception. I am most fortunate to influence other teachers, because of the influence of PiL. Thanks Jacynth, Lia and Mario. See you soon in Niagara Falls !! When I found out I was going to San Diego, I knew right away that I wanted to visit the infamous High Tech High. I emailed a number of people with no response. However, a quick email to a fellow Canadian Chemistry teacher was golden. She responded and was very welcoming to this stranger from the Internet. She gave up a couple of hours during her day to talk to me. They have an interesting setup. They are finding ways to do GRAND PROJECTS from RHS in the regular day at the MAIN focus and the courses were boiled down to the essentials only. They have been doing for many years the vision that I created on my own just in the past 2 years and called it SHAD High. She commented on how the name “High Tech High” may have been accurate in the past, it is certainly not an accurate portrayal of what makes them special. They are special, but not because of anything High Tech. There is about 1 computer for every 2 students. The students do not have much variety in the courses that they take. In fact, all students take the exact same basic courses. However, the teachers create these “Science 12-ish, Renaissance College, Shad Valley-ish” projects that do get the variety. Yes, they are doing a chemistry project, but there is journalism, ethics, politics, economics, art, graphic design and cinematography embedded in the project. One project that they did had students create a sort of barcode test that would help track poached meat in Africa. So park rangers could stroll through the local markets, take a tiny sample of meat and quickly know if it was poached or not. The real innovation is the creation of a place where that type of project is possible. I have long said that it would be a good day when our high schools look like kindergartens. High Tech High reminds me of this exact situation. I know that some key members of Miramichi also visited High Tech High. Miramichi I think is the most innovative district around. It seems that there is some commonality here. If they can do it in San Diego, and if they can do it in the Miramichi, why can’t we do it here at RHS?? 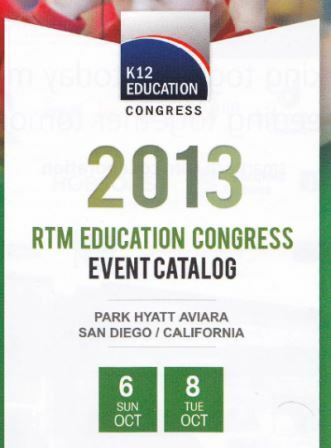 K-12 Congress is an INVITATION-ONLY conference for superintendents and higher from all over the US. How is it that I am here in the same program as people like Dr. Yong Zhao, Sir Ken Robinson and Dallas Dance. Dr. Zhao spoke on a panel with two other fine gentlemen. They talked about the pro’s and con’s of Common Core. While the other two gentlemen talk about this and that, Dr. Zhao got right to the point and was a level higher. One thing he said was that Common Core in and of itself is probably a good thing, but when you attach high stakes assessments, rankings and careers on some kind of standardized test, the whole thing will turn into something ugly. Dr. Zhao would be a proud supporter of “SHAD HIGH”. I found it funny that one of the other panelists commented on how his home country was Communist and that it was therefore not quite as good. My thought is that if Communist country is being more innovative and careful of the individual students that the US is, perhaps the US is in serious trouble? Maybe Canada is the perfect middle?? Sir Ken spoke about some of the same themes as he had before, with 2 different slants. He talked about how is daughter loved everything French. French food, geography, history, boys, music etc… Yet when Sir Ken went into parent-teacher interviews (how intimidating would that be? ), the teacher comments about how his daughter might fail because of her attitude. Sir Ken was then curious as to what attitude was. Was she lazy? nasty? arrogant? Nope… none of those. The teacher said, “she acts like she is bored.” Those other attitudes, were they present, would be owned by the student. But boredom is owned by the teacher. So Ken finally says, “Perhaps she is bored.” and put the ball in the teacher’s court. He talked about civilizations, empires and society. He talked about how in the 1880’s the British Empire was the largest empire the world had ever seen, was world pervasive, and the sun never set on it. Liverpool was the busiest port in the world and London was the center of the universe. He wondered what would happen if a person were to walk into the Royal Court and say, your grandchildren will live in an impoverished, beaten, and devastated state and the empire would be in ruin. And true enough, by the end of World War 2, that is exactly what happened. He drew many parallels between the Roman, British and American Empires and tried to bring a sense of urgency and priority that this thing called Education will have on the economy of the US and the standard of living for our kids and grand kids. There are many developing countries that have figured this out and are investing. How long will the US be able to hold onto their lead? China, India and Korea are all making sweeping changes and have momentum. At the end, the President of SMART let me car pool with him to the airport and then to High Tech High. I really appreciated how welcoming he was and how down to earth he was. He asked me a couple of questions and I answered honestly as best I could. I hope I did not violate some kind of protocol. Car Pooling is awesome both for the environment and for conversations with a different flavor. The rest of the SMART Team was their typical awesome selves. In the Words of David Lapides, “Never Surprised, Always Impressed”. The new part for me was sitting in on the meeting, listening to the plan of where people would sit at supper and watching how business works…and meeting with the president.